In the first of a two-part series, David Patrick, Head of Marketing at Redland, takes us on a round Britain tour of the nation’s roofs – this month it’s the south and south east. The architectural heritage of Britain is a rich one, and roofs – and their tiles – have a long tradition, which inspires many modern materials today. 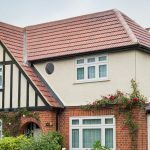 While there is no particular reason why any particular type or tile should be specified for any given roof; certain styles obviously dominate in regions of the UK – and here we look at the two most common types to be found in London and the south east. While everybody knows that the WW2 blitz wrecked a large number of British cities – Liverpool, Coventry, Belfast, Plymouth, Manchester, Hull, Cardiff and Newcastle, to mention just a few, all have sorry tales to tell – it was London where most properties were destroyed, Although the concentration of damage might have not been so intense as in, say, Coventry and Plymouth; of the total estimated loss of 2,000,000 homes, one million were in London. As a consequence, there was an urgent need to replace these homes and the immediate post-war period saw a huge surge in house-building. Necessarily, mass produced materials were needed to fulfil this huge demand. The mass-market Redland 49 medium-format interlocking cambered tile, launched in 1949, rapidly became the roof covering of choice, and its use is still extremely widespread through the city to this day. 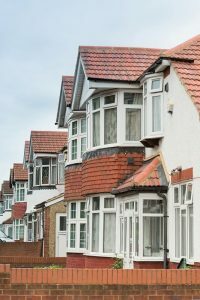 Although common throughout the UK, if one were ever asked to picture a typical English scene, the odds are there would be a plain tiled roof somewhere in the middle of it – and particularly in the south east. 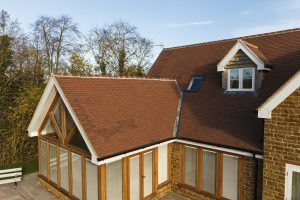 Clay plain tiles have been a part of the British building tradition for hundreds of years. But what many won’t know is that their size – in olden times – was actually dictated by an Act of Parliament introduced by King Edward IV in 1477. This set plain tile dimensions at 10 ½“ long by 6 ½” wide. The law was necessary to stop unscrupulous manufacturers skimping on sizes to save on material costs; and that size standard still exists today. The plain tile has remained practically unchanged for hundreds of years. Concrete and clay plain tiles are possibly the most versatile of tiles because of their small size and double-lapped installation, the method of plain tiling is simple: the roofer needs to keep to the minimum headlap, which is normally 65mm, and the minimum side lap, which is 55mm. In practice, this means that the tiles will work just as well, provided the side joint is anywhere within the middle third of the tile below. Next week, we’ll look at the types and history of tiles found in Wales and the north, the west and eastern England. For further information on Redland click here.